Synonym _ Saraca indica auct. non L.
We can see a clear description from Atharva veda parisita. 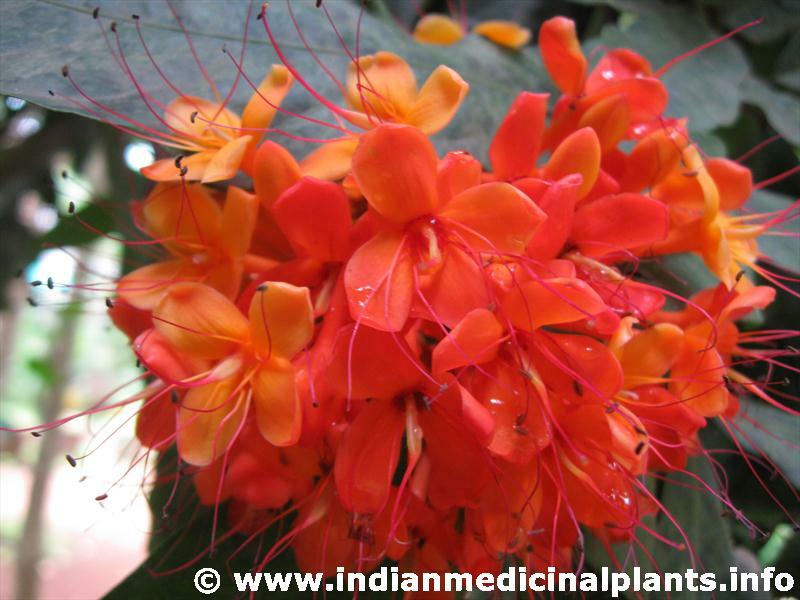 This plant is known as friend of female also a good uterine tonic. It is a small ever green tree with drooping glabrous branches, 8-10 m. in height. Leaves pinnate, 10-20 cm. long; leaflets 2-3 pairs, rigidly subcoriaceous, oblong or oblong-lanceolate. Flowers- in dense axillary corymbs, fragrant, orange or orange-yellow, finally turning vermillion-red. Fruits- pods, flat, oblong, woody, about 8 x 20 cm. seeds- 4-8, ellipsoid oblong, compressed (Flowers in March-April and fruits in August- September). Dosha : Rapha, pittä kshayakarak. Dhatus : Rakta (haemostasis), meda, rasayana. Mala : Purisha ( astringent), diuretic. Ayurvedic _ Ashoka, Ashoku, Hempushpa, Taamrapallava, Pindapushpa, Gandhapushpa. for suppressedmenses, leucorrhoea, menstrual pain, menorrhagia, complaints of menopause. Also used for dyspepsia, biliousness, colic, burning sensation. Flowers—poundedand mixed with water, used in haemorrhagic dysentery, bleeding piles and retention of urine. External uses : The bark has analgesic and antidotal properties. Hence its paste is used in pains and poisoning for local application. Nervous system : It has effect on the nerves and therefore is used in painful vata disorders. Circulatory system It has haemostatic. blood purifying and antioedematous effects Hence 1t is used in diseases of the blood and oedema, its lowers are used in internal bleeding. Reproductive system : It strengthens the muscles of the uterus and reduces uterine discharge and pain in the uterus and so it is useful in rnenorrhagia. leucorrheoa and dysrnenorrheoa Since the decoction of the bark acts as a tonic for the endometrium of the uterus, it is useful in many diseases of the uterus. Urinary system : By virtue of its diuretic property, it is useful in dysuria and calculi, It prevents the formation of a calculus. Temperature : It reduces the burning sensation frequently associated with pyrexia. (1) Rakta Pradara- Cold milk boiled with the decoction of Asoka bark is useful (V.M. ).